Choose the right answer from the four alternatives given below. (i) The convectional currents present below the solid layer of Earth's crust split the crust or the lithosphere into a number of large fragments. These fragments are called tectonic or lithospheric plates. (ii) The continents that were part of Gondwana land are Australia, Antarctica and South America. (iii) The bhabhar is that part of the Northern Plains where the rivers, after descending from the mountains, deposit pebbles. It is a narrow belt, having a width of about 8 to 16 km and lying parallel to the slopes of the Shiwaliks. (iv) The three major divisions of the Himalayas from north to south are the Great Himalayas/Inner Himalayas/Himadri (Northernmost division), the Lesser Himalayas/Himachal and the Shiwaliks (Southernmost division). (v) Malwa plateau lies between the Aravali and the Vindhyan ranges. (vi) Lakshadweep Islands are composed of small coral islands. Locate the peaks, passes, ranges, plateaus, hills, and duns hidden in the puzzle. Try to find where these features are located. 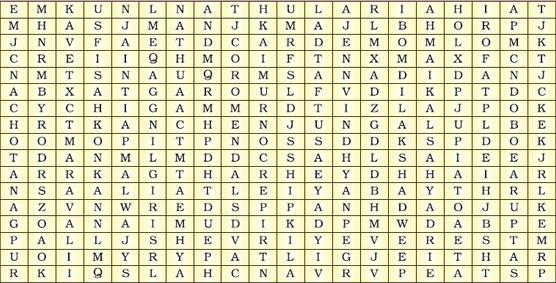 You may start your search horizontally, vertically or diagonally. Describe how the Himalayas were formed. Which are the major physiographic divisions of India? Contrast the relief of the Himalayan region with that of the Peninsular plateau. Give an account of the Northern Plains of India. Contemporary India - Social Science : CBSE NCERT Exercise Solutions for Class 9th for Physical Features of India will be available online in PDF book form soon. The solutions are absolutely Free. Soon you will be able to download the solutions.